I’ve been wanting to do something a little different in my kitchen for a while but couldn’t really decide. I had bought the paint months ago yet I wasn’t sure if it was the right color. I mean, I had painted it in over half of my house now, would it look right in my kitchen too? 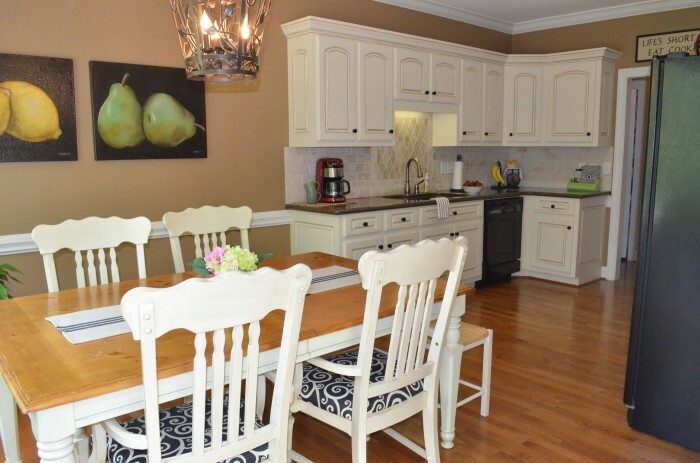 But then I saw Beth’s kitchen at Unskinny Boppy and I KNEW I had picked the right color! SO, here is my newly painted kitchen, in Sherwin Williams Mindful Grey. I used that ladder to cut in where you see in this picture then did the rest with a super tall ladder all by myself. My husband was out of town so I had my daughter be my spotter…scary few moments but once I start a paint project I finish that day if possible. Plus my husband HATES painting so I rarely never ask him to help. The new color made the cabinets looks new again and brightened the room so much. I LOVE IT! Here is a close up showing the old color and the new color. There are a few changes other than the paint that you may have noticed if you had already taken my kitchen tour. I took down the window treatment and removed a layer of fabric from the chairs (they have been recovered a few times!) I’m liking what was underneath the black swirl fabric. I’ll focus more on those things and the finishing touches in Part 2 of the Makeover coming very soon. Have you updated a room with paint lately? I’d love to hear about it. Your kitchen is AMAZING. Can you tell me if the hardware is flat bronze, brushed bronze, or flat black? Very classy! This tones down the similar colors of your floor, table top and walls. In my opinion the paint brings the room up to a higher level! I cannot wait to see what else you do with the rooms. I totally agree Dianne! Thanks for stopping by to look around! Love it! We have re-done every room in our house except 2 including the kitchen. Yours is beautiful! Thank you so much! 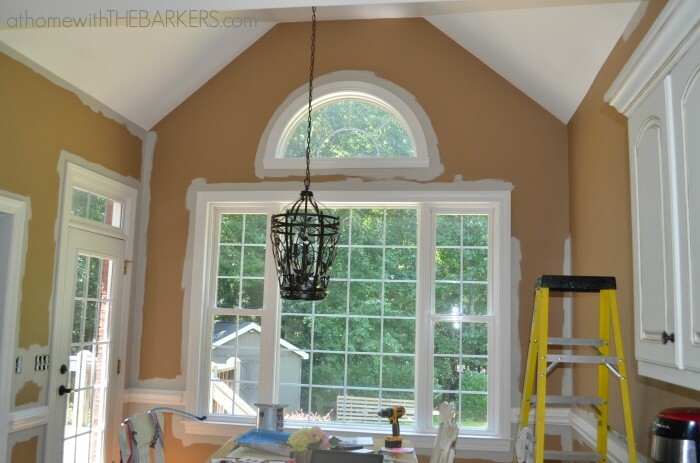 My kitchen has been one of my last rooms to paint…still need the master bedroom done! I love the change that paint fives a room. Love that gray, so clean and serene looking. It does make your cabinets look like new again, Love your light over your table. I too prefer to do my own painting to avoid a lot of negativity from hubs. One time in KY I got a wild hair to paint the living room. Didn’t want to have to go into town to get paint cause I knew by time I got back I’d be out of the mood. My son had left about 3/4 gal. of white semi-gloss paint so I went into my studio to see what color I had I’d want to have the l/r. Ok it’ll be a soft tan. I found every brown bottle of acrylic paint and poured it into the semi gloss white til I got the color I wanted. Couldn’t find the painting trays, rollers so I used one of those flat tools that’s used to go around windows. Used that to paint whole living room, and it was a big room but I was determined. I started about 11 a.m., I guess by time I got every thing ready and moved. Took me til about 7 that night but I got it done and I loved it. Had to paint around 4 big windows on front wall of l/r. I had to stop a few times to rest, have lunch and supper, move furniture. We had high ceilings so that took me longer. I was sick of living with white everywhere. When we bought the house from oldest son after he remodeled it, etc. I asked him to paint different colors but he said no if I wanted that I’d have to do it later, he wanted to get the house done, he had other jobs he needed to get to. Ah well, did get it done and was quite happy with it. He just chuckled when I told him what I’d done. Sonya! This looks amazing! What an amazing transformation, and I am super impressed that you got on the ladder and did that tall ceiling all by yourself. It’s amazing what a fresh coat of bright, light paint can do for a room. Your kitchen looks outstanding! Thanks so much for the mention! I’m glad I inspired you! 🙂 Scheduling this post to be shared on my facebook page for later today! It looks great! You did a fantastic job painting that! Wow! Looks wonderful. I really like the new color, it really freshens up the kitchen. Please consider sharing this at my new party, Stylish Friday Finds. My readers would love seeing your kitchen! This is my first “party” and hoping some guests show up today! LOL! hi! Looks great. I used mindful grey in my office and media room. Love the color. Sonya, your kitchen looks SO good! And I’m impressed you got up there and did the high ceilings. One of my biggest fears is heights, so my stomach turns just thinking about you all the way up there! 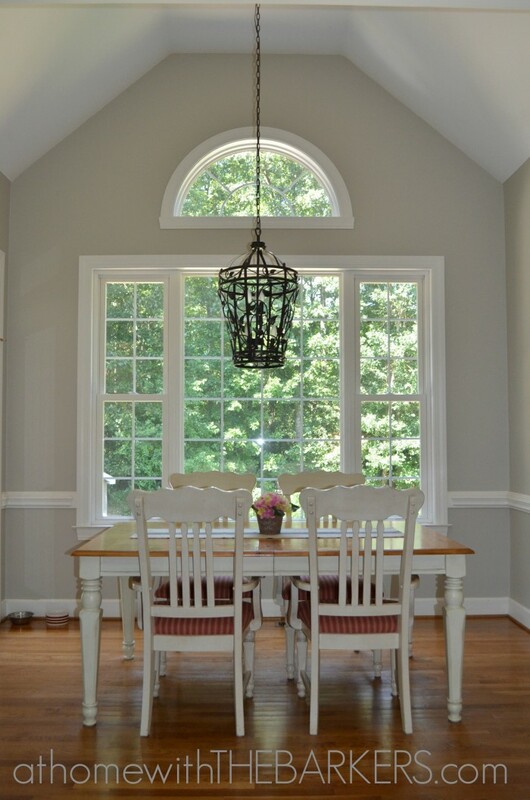 The Mindful Gray looks great and I’d love to feature this on my paint color blog, Involving Color. Let me know if you’re interested! THANK YOU! The cabinet color is Sherwin Williams Antique White. Sounds like you really are ready for a change. Wow this looks great! Where did you get that chandelier over the table? I have been on the look out for something to match my other lights. Oh….I just love mindful gray. Just got done painting my living and dining room and mudroom the same color. Your kitchen looks fabulous. PS. My hubby hates to paint too. I have it in most of my house now! It’s a great neutral. Your kitchen looks beautiful! I am on a total gray kick right now in our new home and I am searching for the perfect gray for our family room that gets tons of light! I’ve tried several different grays and my most recent choice looks blue by day but gray by night! Have you found that the Mindful Gray has any other hues in it? I’m trying to find a true gray and this may be the one! Thanks for any feedback! It is the perfect gray for the lighting in my house! I think you will look it but all colors do change with lighting so give it a try! Wow! I am impressed you did the painting, that is one big wall with the windows. Love your new color choice, I have grey owl as my paint color and am loving it. What colors did you use on the cabinets? I love them and this would lighten up my kitchen so much. Great job! Looks fab! I just bought this color last night and am painting my main living area today. I’m a bit nervous but I think it will be so pretty. Did you find it had any specific undertones? This is the most true grey paint I have used. I think you will love it!! I just painted my kitchen and hate it. It’s too baby blue. I wanted a gray with a blue hint/tint to it. Would you say that this gray does that? it sure is pretty. Hi Mindy, I agree with Sonya, Mindful Gray is a true gray/grey… It’s a warm gray, but without looking taupe/brown. I bought many samples of different grays before settling on Mindful (loved Stonington Gray by BM, but as neutral as it’s suppose to be, I saw blue – you may like that one and/or Coventry Gray by BM… Light French Gray by SW may be a good one for you too.) Lighting is key with all colors, however, I have Mindful in a south facing room and a north facing room and it looks gray in both rooms with no signs of blue or purple. Paint experts say that if your room faces south it can handle cooler colors and if it faces north it’s best to stick with a warm undertone. Hope this info helps, good luck! 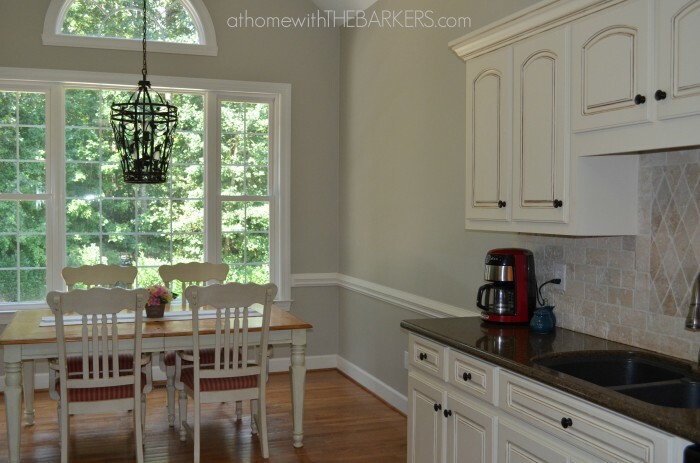 Just curious on both the Hopsack and the Gray colors on your walls which sheen did you choose and also I absolutly love the cabinets, in the middle of renovations and was looking to reface kitchen cabinets with beadboard and I love the look of yours in those colors. Thanks for sharing! I always use eggshell or satin on my walls. 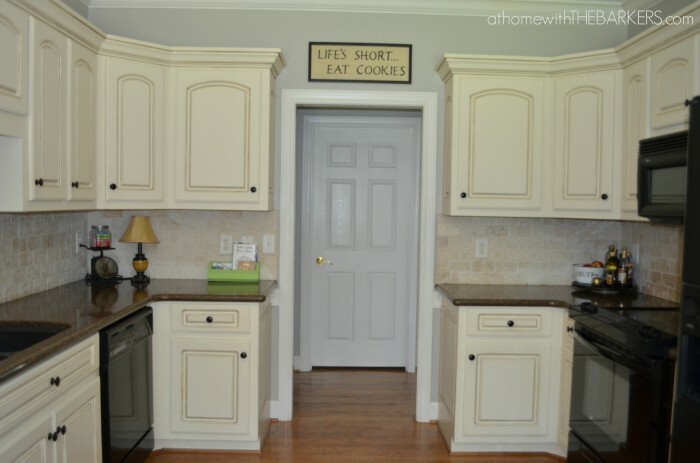 Love your kitchen cabinets! I have painted mine antique white and am now on to the glaze. Valspar does not carry the umber color that you used on yours. Can you recommend a color that is similar? Also, would like to know the color white used on the doors and trim. There are soooo many color whites! Such a hard choice to make. Thanks so much! Love your kitchen! I’ve just started looking through your blog (started with the post about glazing your cabinets), and I’m loving everything you have done! I was hoping to get your opinion. We have a lot of wood tones in our house, the molding is wood, as well as the floors. The cabinets are being painted in the antique white color. Our kitchen/dining room has very little natural light. When we bought the house, it was a very “plain jane” beige in the room. I’m looking for a color that will not darken the room (since it already seems that way at times with one small window), given the wood molding and flooring (probably an oak/golden oak color) what colors do you think would work best in that room? So happy you found me and welcome!! You definitely need a gray color. Gray’s are cool and look so great with warm wood tones. I have mindful gray on my walls and it is the most perfect shade of light gray but I do have lots of light. You could go one shade lighter if needed to Repose Gray. These are Sherwin Williams colors. I always recommend sampling them in your room. Good Luck! 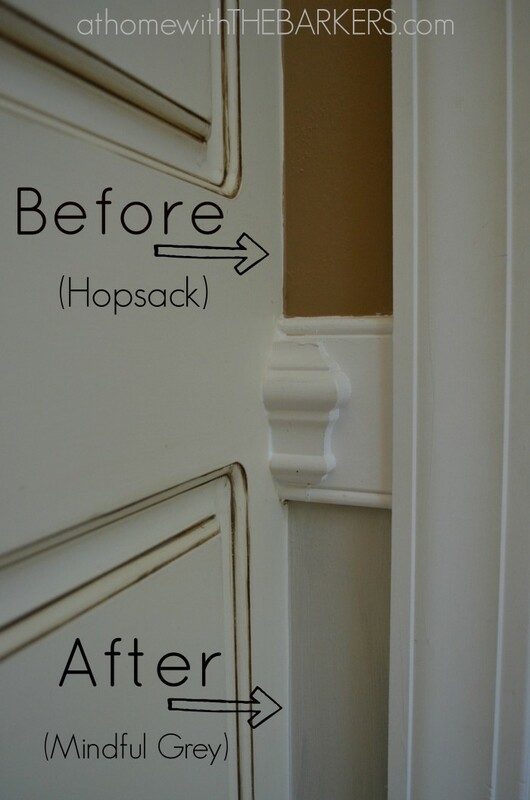 How many coats did you use, and did you use a primer/paint with primer? I will re-painting in our new house and the kitchen cabinets look similar to yours, are yours a cream? 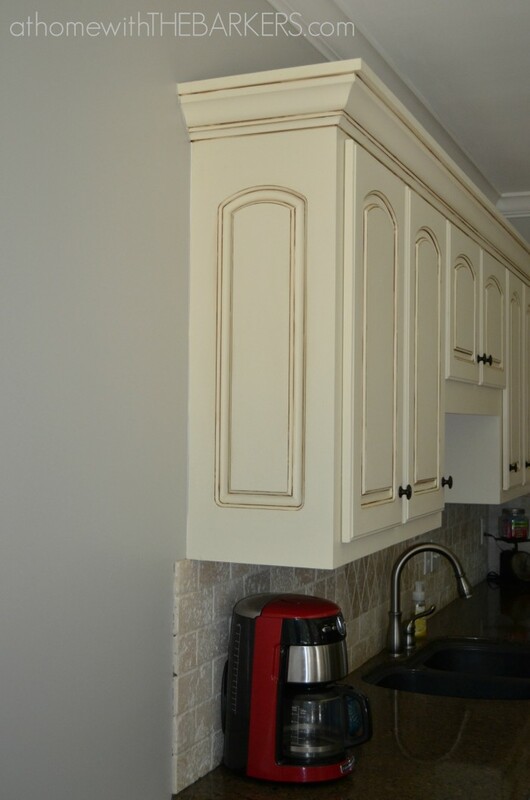 I am having a hard time deciding if the gray looks ok with the cream/brown undertones of my cream cabinets.